ICC’s goal is to raise $125,000 to fund 10 communal farms. The funds will directly support the cultivation and planting of 125-acre plots in up to 10 rural villages. Answer: The Fula people, or Fulani in Hausa, are a large ethnic group that is widely spread across all of Sub-Saharan Africa. There are more than 5 million Fulani currently in Nigeria. A large portion of this ethnic group continues to live a nomadic lifestyle, herding mainly cattle, but also goats and sheep across countries, keeping themselves separate from the local farming communities and national identities. 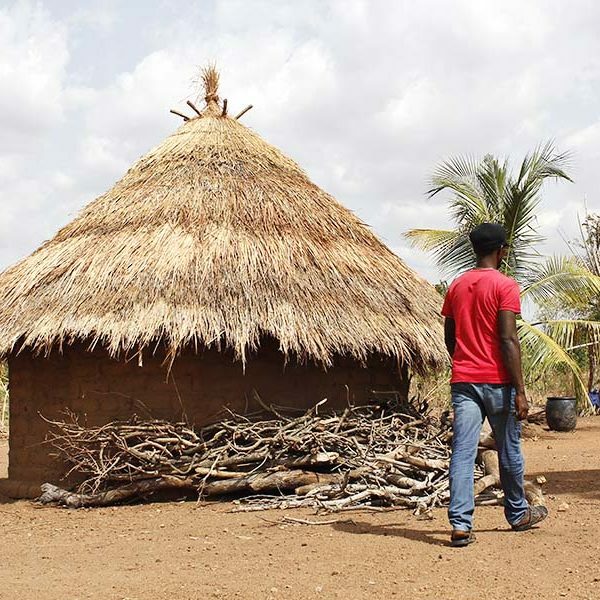 Why are militant Fulani attacking Christian villages? 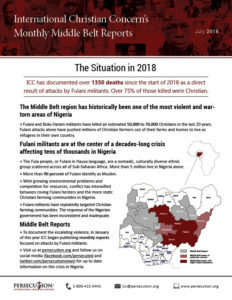 Answer: There have always been a level of conflict between Muslim Fulani herders and Christian farmers, but in recent years the fighting has significantly increased. In most villages that are attacked, churches are destroyed and clerical homes are burned down. There have been clear signs of contempt in the way that these militants target any form of Christian identity. How do they compare to Boko Haram? Answer: Currently, Fulani militants are a greater threat than Boko Haram to Nigerian Christians. Boko Haram’s ability to conduct large-scale attacks has decreased. They have been primarily pushed back to two northern states, which are also majority Muslim. That has made it so that they are unable to attack Christians as often as they were several years ago. The Fulani, however, are not being stopped from attacking Christians in any way. They are able to freely move through any area in Nigeria, and have killed and attacked many more people, especially Christians, in 2018 so far. Will ICC need to teach the victims how to farm? Answer: No, the victims are farmers and know how to farm already. They don’t want a handout; they want to be able to raise crops for sustenance and for sale as they always have. Answer: Each farm will cost about $12,000 and feed 500+ victims for an entire year. This is an incredibly effective means of caring for the victims of Boko Haram and Fulani militants. In the end, it works out to about $30 per person to feed them for an entire year. Additional funds will expand these farms and keep them going for years to come. Stay informed on the situation that Christian farmers face on a daily basis in Nigeria’s Middle Belt region. Christian farming villages are repeatedly attacked in Nigeria’s Middle Belt region. Tens of thousands have died over the last 20 years. Nigeria is actually the bullseye of Christian persecution in the world, but few are aware of it. Hundreds of thousands of Christians have lost everything and are living as refugees. Boko Haram: Organized, structured, armed Islamist militant group based primarily in the North. Remember the kidnapping of the Chibok Girls? That was Boko Haram. Fulani Militants: Nomadic cattle herders that are armed and intent on driving Christians out of Nigeria’s Middle Belt. They attack Christian farming villages at night and kill the Christians using machetes and guns. They are just as deadly as Boko Haram but less well known. ICC cannot solve the problem in Nigeria on our own. We have been and will continue to help the persecuted in Nigeria through Advocacy and Awareness, but our main focus is to rescue the victims. The victims are farmers, so ICC is setting up farms for them! Simple, right? The victims don’t want a handout. They know how to farm; they just want to be able to make a living and feed their families in the way they know how—farming. ICC plows and tills the land. We then provide seed and fertilizer. The Christian victims then plant, tend, and harvest the plants and crops. Each farm will yield 2 crops in a year. 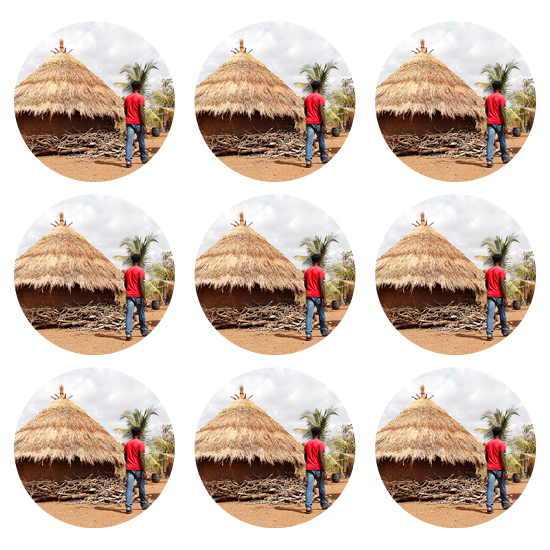 Each of the 10 farms will feed approximately 500 Christians. This work can only go forward in partnership with you.